The fauna of the Aleutian and Alaska Peninsula area was surveyed and documented in 1936-38 by Murie and Scheffer. They offer interesting details about the animals' distributions and uses and their book is used as a guide for this page. The complete book can be downloaded for free here. Probably the only thing that has changed much since 1938 is the number and perhaps distribution of some of the animals. The Unimak area has a large number of animal species and only a small percentage can be covered here. This area of the world has prolific wildlife due to the great productivity of the North Pacific-Bering Sea marine-island environment. The red salmon or sockeye (Oncorhynchus nerka), is the most highly prized salmon in the Unimak area and has the highest commercial value. It is an anadromous species of salmon found in the Northern Pacific Ocean and rivers discharging into it. Red salmon is the third most common Pacific salmon species, after pink and chum salmon. 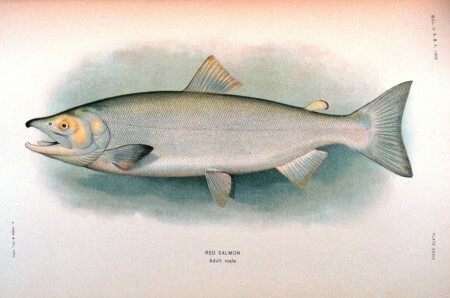 Red salmon first appear around False Pass at Swede's Lake on the Ikatan Peninsula in late May and are prized as the first fish of the season. Click on drawings below for larger versions. The silver or coho salmon, (Oncorhynchus kisutch), (from the Russian кижуч kizhuch) is a species of anadromous fish in the salmon family. 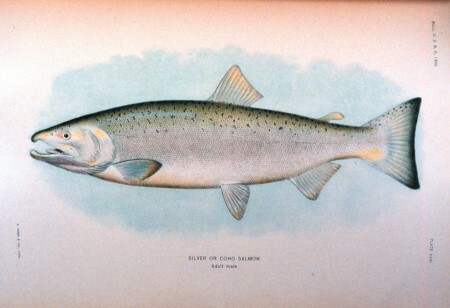 Coho salmon are also known as silver salmon or "silvers" in the Unimak area. Silver salmon are the species usually chosen for putting up salt salmon in barrels in the fall in the Unimak area. Since the demand for commercial salt salmon has fallen off, most salting is now done for subsistence use. The dog or chum salmon, (Oncorhynchus keta), is a species of anadromous fish in the salmon family. 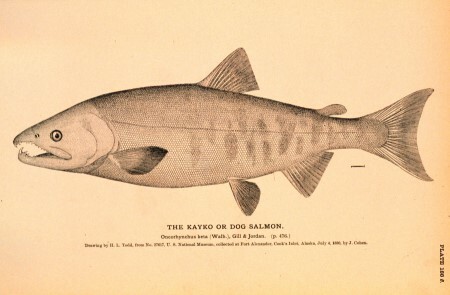 The name Chum salmon comes from the Chinook Jargon term tzum, meaning "spotted" or "marked", while "Keta" comes from the Evenki language of Eastern Siberia via Russian. Most Chum salmon spawn in small streams and intertidal zones. They spend one to three years traveling very long distances in the ocean. They die about two weeks after they return to the freshwater to spawn. Pink salmon or humpback salmon, (Oncorhynchus gorbuscha), (from a Russian name for this species gorbuša, горбуша) is a species of anadromous fish in the salmon family. It is the smallest and most abundant of the Pacific salmon. In the Unimak area these salmon are often called "humpies". Pinks (along with Chums) are now the lowest value per pound commercial salmon in the Unimak area. They are usually caught in beach seines by local fishermen and the run is strongest every other year when they can appear in large numbers. The king or chinook salmon, (Oncorhynchus tshawytscha) (derived from Russian чавыча, which in turn comes from a common name used among natives in Alaska and Siberia), is an anadromous fish that is the largest species in the salmon family. Locally, they are known as kings. The king is blue-green or purple on the back and top of the head with silvery sides and white ventral surfaces. It has black spots on its tail and the upper half of its body. Its mouth is often dark purple. Adult fish range in size from 33 to 36 in (840 to 910 mm) but may be up to 58 inches (1,500 mm) in length; they average 10 to 50 pounds (4.5 to 23 kg) but may reach 130 pounds (59 kg). 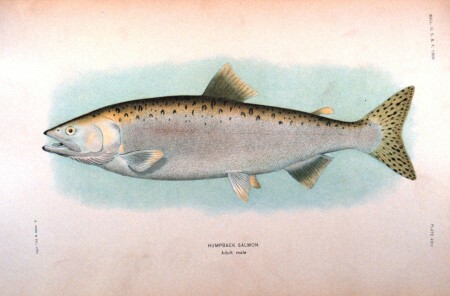 King salmon may spend 1 to 8 years in the ocean (averaging from 3 to 4 years) before returning to their home rivers to spawn.5 Since there are no large river systems in the Unimak area, the few kings that are caught locally are traveling fish, on their way to the river of their birth to spawn. 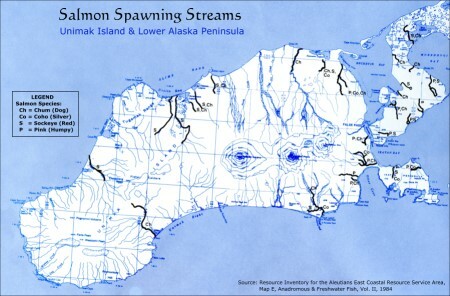 Salmon spawning streams in the Unimak area are shown on the map on the right. (Click on map to see a larger version.) In general, the most productive streams are on the north side of Unimak and at the head of Morzhovoi Bay. Red salmon or sockeyes spawn and are caught in commercial numbers from local runs mostly on the north side at Urilia Bay, Swanson's Lagoon and the head of Morzhovoi Bay. Smaller red runs are at Hot Springs, Sankin Bay, Deadman's and Swede's Lake. Silvers or Cohos spawn and are caught near Swanson's, Mike's Creek, Big River, Lazaref, Swede's Lake, Salmon Ranch and Middle Lagoon. Humpies or Pinks spawn and are caught near Mike's Creek, Sourdough, Big River, Otter Cove, Swede's Lake, Salmon Ranch, Sankin, Deadman's, Trader's Cove, Boiler Point. Chums or Dogs spawn and are caught near Urilia Bay, Otter Point, Swanson's, Mike's Creek, Sourdough, Big River, Lazaref, Lutke, Trader's Cove, Hot Springs & Hungry's. 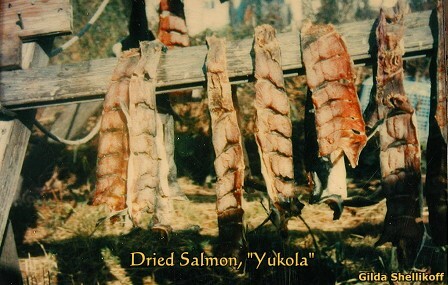 Dried salmon, called Yukola locally, has been one of the traditional mainstays of the Unangan/Aleut diet. The name comes from Russian: (юкола) meaning dried fish. The original Unangan name for yukola was Udax^. It is usually made in late summer from chum salmon but sometimes pinks are used. Oily salmon cannot be used as the oils turn rancid when exposed to the air. Yukola is simply air-dried salmon, without any smoking. Some people put it in a salt brine briefly before hanging to dry. These days, many people have special sheds with window screen to exclude the flies that can present a big problem during the drying process because they lay their eggs on the fish. The important thing is to have lots of fresh air movement over the fish so it will dry nicely. Yukola will keep well for winter use as long as it is kept cool and dry. Yukola can be eaten as is and was traditionally eaten with tea and bread. The salmon skin is often eaten after being made crisp over the fire. Geographic range: Coastal waters of Alaska, British Columbia, Washington, Oregon and into northern California. The center of abundance is the central Gulf of Alaska, particularly near Kodiak Island. 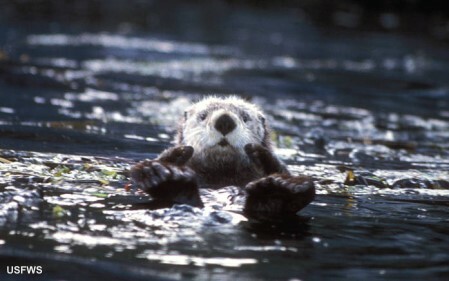 Habitat: Juveniles (1 inch and larger) are common in shallow, near-shore waters 6.5 to 164 feet deep in Alaska and British Columbia. Halibut move to deeper water as they age and migrate primarily eastward and southward. Life span: Females and males both live to be quite old. The oldest halibut on record (IPHC) was a 55 year old male, but halibut over the age of 25 are rare. Food: Juveniles eat small crustaceans and other bottom-dwelling organisms. Mature halibut prey on cod, pollock, sablefish, rockfish, turbot, sculpins, other flatfish, sand lance, herring, octopus, crabs, clams, and occasionally smaller halibut. Growth rate: Both female and male halibut grow about 4 inches per year until about age 6. From then on, females grow faster and reach substantially greater sizes. Growth rates of both sexes have varied greatly over the last century and depend on abundance of both halibut and competing species. Maximum size: Halibut can weigh over 500 pounds and grow to 9 feet. Males are smaller than females. Females mature around 12 years old; males mature around 8 years old. Reproduction: A 50-pound female can produce about 500,000 eggs; a female over 250 pounds can produce 4 million eggs. Females spawn once per year. They release their eggs in batches over several days during the spawning season. Eggs hatch after 12 to 15 days. The larvae slowly float closer to the surface where they remain in the water column for about 6 months until they reach their adult form. They then settle to the bottom in shallow water. Spawning grounds: In deep water (approximately 600 to 1,500 feet) along the continental slope, concentrated at a number of locations in the Bering Sea, Aleutian Islands, Gulf of Alaska, and south to British Columbia. Migrations: Adults migrate seasonally from shallow summer feeding grounds to deeper winter spawning grounds. Cod has always been common in the Unimak area but it essentially disappeared between about 1940 and the late 1950's. Cod was the primary commercial fish in the Sanak area from about 1900 until around 1940 and permanent codfish stations were established at Company Harbor and Pauloff Harbor (see village information on this website). Another half-dozen codfish stations were established in the area before 1920, but they were abandoned after only a few years in operation. The schooner-based cod fishery from the Puget Sound area of Washington also operated in the Unimak area, but their influence locally was very minor. Beginning in the early 1970's, cod began to reappear in the Unimak area. About 1991, fishermen from False Pass and King Cove resumed commercial cod fishing, using pots and jig. The cod catch is processed in King Cove. 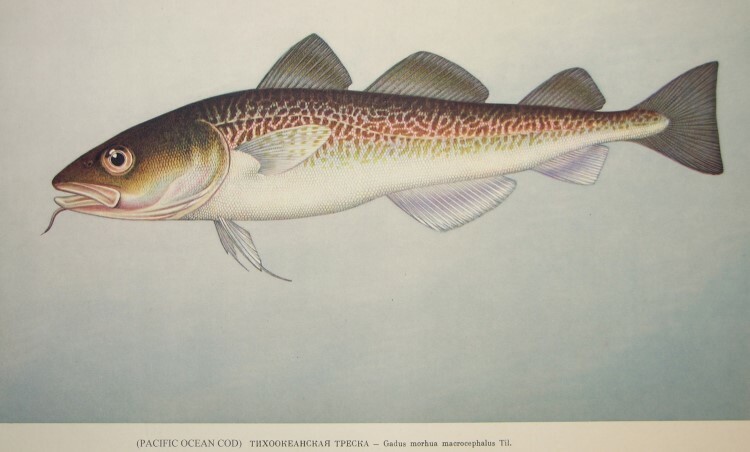 Habitat: Cod are demersal, living near the bottom, and concentrate on the shelf edge and upper slope (328 to 820 feet deep) in the winter and move to shallower waters (less than 328 feet deep) in the summer. Pacific cod have been found as deep as 2,871 feet. Adults and large juveniles prefer mud, sand, and clay habitats. Growth rate: Moderately fast growing Maximum size: Over 6 feet. Females mature at a length of 1.6 to 1.9 feet and at about 4-5 years of age. Reproduction: Females have high reproductive potential - a mature female can produce over 5 million eggs. Pacific cod are single batch spawners, releasing all of their ripe eggs in a single spawning event within a few minutes. Migrations: Individual adults have been found to move more than 621 miles. Pacific cod also move seasonally from deep outer and upper shelf spawning areas to shallow middle-upper shelf feeding grounds. They are a schooling fish. Predators: Predators include halibut, sharks, seabirds, and marine mammals. Commercial codfishing regulations are complex and controlled by the ADF&G (Alaska Dept. Fish & Game) in state waters29 and the NMFS (National Marine Fisheries Service) in waters of the EEZ.30 Since cod is usually fished in seasons different from salmon, local commercial fishermen now often fish nearly the year around. The Alaska Dept. of Fish & Game has species information on common Alaska fish here. Bidarkis are named after the Russian name for the Aleut Iqyak or kayak (literally, little baidar or skin boat) due to its shape. 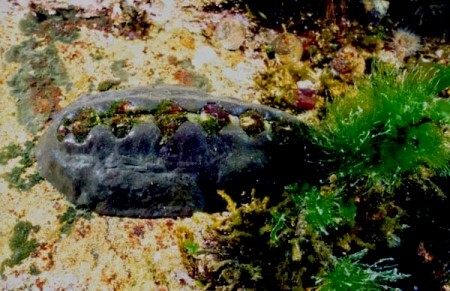 These black chitons are relished by local people and are harvested off the rocks on low tide. The "foot" is often eaten raw. Bidarkis tend to move away from the light so that one usually has to look under rocks and into crevices to find them. 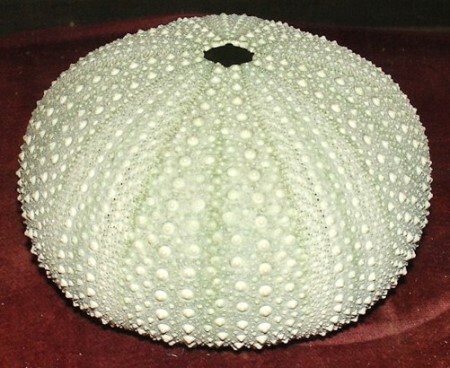 "Strongylocentrotus droebachiensis, the green sea urchin, is one of the most common inshore animals of the Aleutian Islands. In many places it is possible to look down from a boat through the clear water and see thousands of individuals side by side in a submarine garden of green. <N.B. : This was 1938 when the urchin's predator, the sea otter, had been exterminated in this area.> It occurs on rocky bottoms more frequently than on sand. Several specimens dredged from deep water (30 fathoms) off Sanak Island were a faded brown in color. Sea urchin spines are so predominant in the refuse heaps of ancient Aleut villages that the middens are grayish in color. 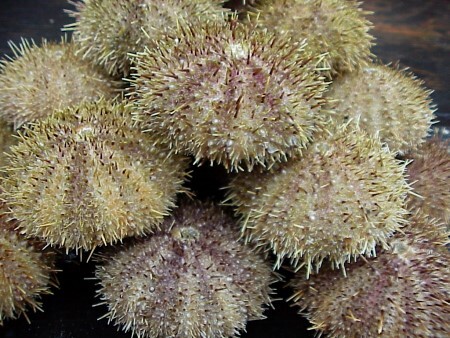 Sea urchins are eaten by the present-day natives. A small child was seen sucking the brown contents of one at Nikolski. The shell was cracked open and the orange part (gonad and liver) was eaten with the fingers. Sea urchins do not seem to be particularly palatable to fish. 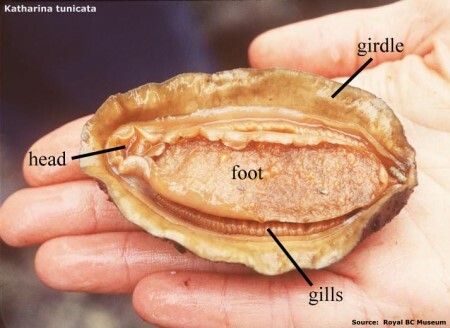 For example, in 20 cod stomachs examined at Chuginadak Island, only 1 small urchin was found. 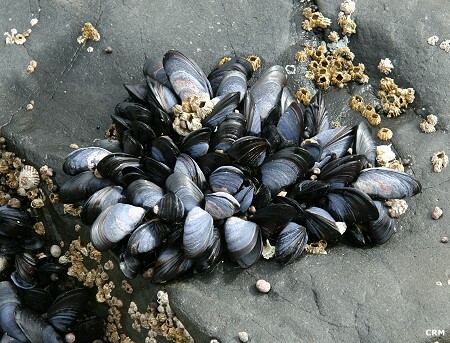 The occurrence of sea urchin remains in sea-otter, blue-fox, and sea-gull droppings has been mentioned elsewhere." "The emperor goose apparently does not commonly nest in the Aleutian Islands, nor on the Alaska Peninsula, but at least one record of nesting was established. During June 1925, a Bureau of Fisheries boat had stopped for a short time at Amak Island, on the way to Port Moller. The pilot informed me that during that stop at least three pairs of emperor geese were seen. On July 10, 1925, during a visit to Amak, I found the remains of a young emperor goose in a bald eagle nest. The feet, stomach, and numerous pinfeathers were present in the nest, and were collected. This appears to be the southernmost nesting locality." "It is well known that the emperor goose is largely a beach feeder; in fact, it has earned the local name "beach goose." Yet, it is reported as occasionaly feeding on the berries of the tundra, notably Empetrum nigrum." The emperor or beach goose is relatively common on the beaches of Isanotski Strait in winter. 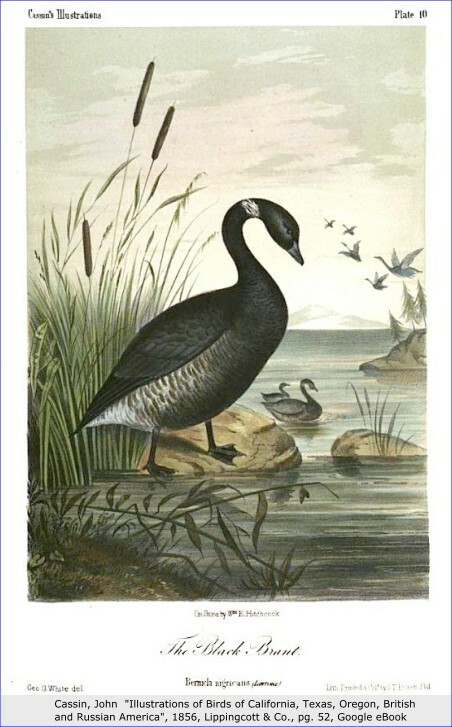 Murie's complete account of the emperor goose is here. 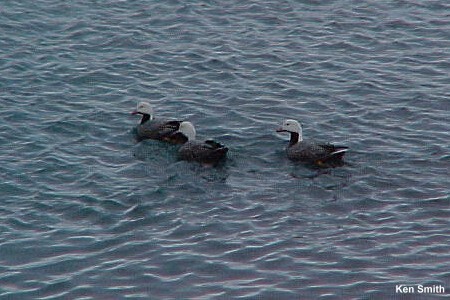 The white-cheeked geese were formerly common migrants throughout the Aleutian Islands area and nested on many of the islands. These populations now (1936, 1937, and 1938) have been universally reduced." "According to local information, they generally arrive at Unimak and the Alaska Peninsula about September 1, but they do not become numerous until 1 or 2 weeks later. Then, they assemble in surprising numbers and congregate at Urilia Bay, Swanson Lagoon, and St. Catherine Cove, all on Unimak Island, and at Izembek Bay, head of Morzhovoi Bay, Nelson Lagoon, and Port Moller on the Peninsula. In 1942, Gabrielson reported the first fall migrant at Izembek Bay as early as "late in July." "In 1925, accounts of the coming of the geese in "countless thousands" and "millions" testified to unusual concentrations, and it is safe to say that this area is the prinicpal gathering place for geese nesting along the shore of Bering Sea northward, as well as those from the Aleutians proper. 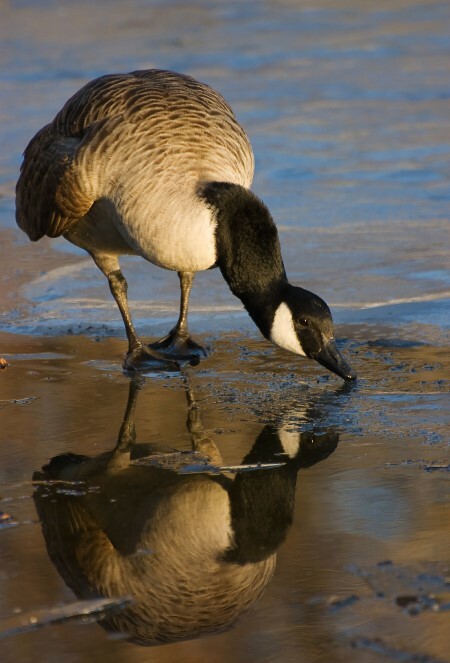 The emperor goose and the 2 forms of the Canada goose all assemble here — of the two, the Canada geese are in the majority." "This area seems to be a place where the geese can fatten in the fall before continuing to their wintering grounds. 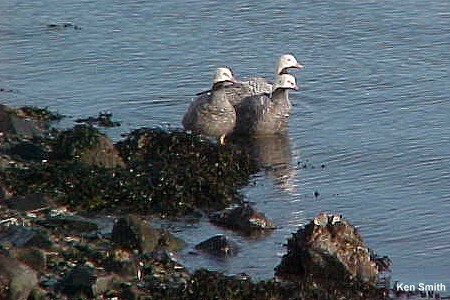 They are said to feed to some extent on eelgrass; minima and leuco-pareia feed mostly on crowberry (Empetrum nigrum) and other berries and spend so much time on the slopes seeking these foods that they are known locally as "land geese" — distinguishing them from the "beach goose," which is the local name for the emperor goose. Murie has a long and detailed account of this "Land Goose" in which he says that Aleuts further out west "domesticated" these geese by clipping their wings to secure food for later in the year. You can read Murie's complete account here. The black brant is only a migrant in the Aleutian district, but it occurs in considerable numbers. <Brant nest mostly on the Y-K Delta.>32 In 1936, we were told at Port Moller that the brant appear there in April, and we received the same information for the Chignik area. We had seen them on northward migration near Seymour Narrows, British Columbia, on April 24, and on Queen Charlotte Sound on April 25. Donald Stevenson, in 1925, said that he had seen them at King Cove "late in April." In 1943, Gabrielson found black brant on the Sanak Islands on April 30, and the next day, at King Cove, he saw 100, or more, heading toward Cold Bay. In 1944, residents at Port Moller reported the first spring flight on April 26. "In late October or early November, brants depart Izembek Lagoon during low pressure systems that generate the favorable southerly winds for transoceanic migration. When meteorological conditions are appropriate, nearly all brants leave Izembek Lagoon within about 12 h, usually at night. Black brants arrive in winter habitats in Baja California within 60−95 h of departure from Izembek Lagoon. <where numbers can reach 130,000>31 They metabolize nearly one-third of their body mass during the 2,600 nautical mile flight across the Pacific Ocean to San Quintin Bay, Baja California, Mexico. "32 This means that the brant fly non-stop for about 75 hours at an average speed of 35 nmph! Black brant are hunted by local people as they stop over at St. Catherine Cove on Unimak Island in the fall to feed before their southern migration. 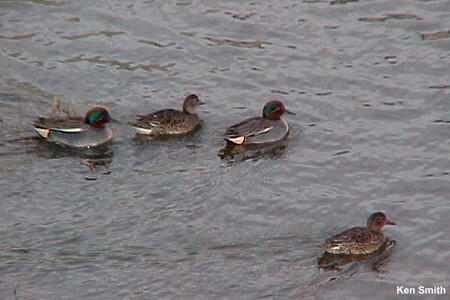 It is now well established that the breeding species of teal throughout the Aleutian chain is Anas crecca. During our expeditions, with only one exception, when a close view of males was possible, or when specimens were collected,- the bird proved to be the common teal. Beals and Longworth collected a male at Unimak Island, June 11, 1941. This is the easternmost point for which we have a record of this bird... 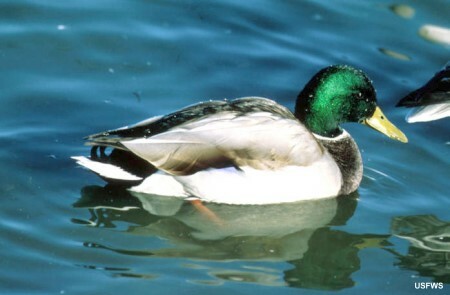 These teals are the most abundant fresh-water ducks in the Aleutians." Murie's full account of the Teal can be seen here. Russian, Commander Islands: Selesenn (Stejneger)"
Murie's complete mallard description can be read here. Russian, Commander Islands: Kamenuschka (Stejneger)"
"This is the most abundant duck in the Aleutian Islands. We found harlequin ducks at practically every island that we visited, singly sometimes, generally in small groups, and occasionally in larger flocks. 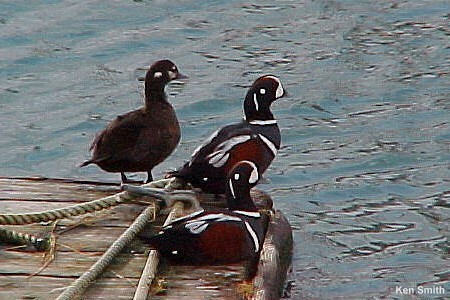 It is safe to say that, at one time or another, harlequin ducks occur at every island, large or small, from Unimak to Attu. Stejneger has reported them to be common in the Commander Islands. The complete entry for Harlequins by Murie is here. 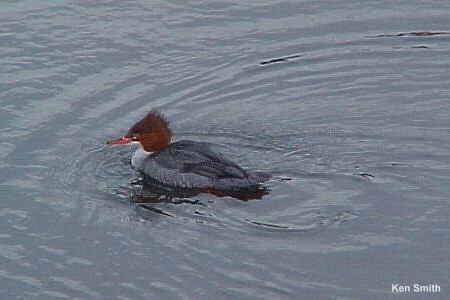 Murie's account of both merganser species is here. 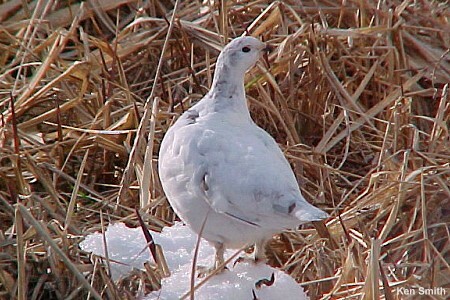 The willow ptarmigan, distributed throughout the Alaska Peninsula, is represented by two races, L. 1. alascensis and L. I. muriei. 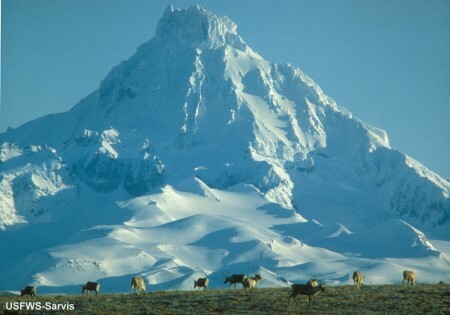 Gabrielson and Lincoln (1949) referred the subspecies on the Alaska Peninsula proper to alascensis, as distinct from the races on nearby islands." Murie's account of the ptarmigan is here. "Turner and Nelson both reported the magpie as common on Kodiak Island, and Friedmann (1935) has listed many specimens taken there. In 1940, Cahalane observed several on Kodiak Island and found them in many places in the Katmai region. We noted magpie feathers at Port Chatham, Kenai Peninsula, in 1936. On May 10, 1936, we saw a magpie on Ushagat, Barren Islands; on May 13, we saw one on Afognak; on May 16, we saw several birds and a nest with eight eggs on Nagai Island, Shumagins; and, on August 26, we saw several at Sand Point, Popof Island, in the Shumagins. We also noted one on Dolgoi Island, May 24, 1937. In 1940, Gabrielson observed the magpie at Kodiak, Sand Point (in the Shumagins), and Brooks Lake. Turner (1886) heard of its presence at Belkofski, and he saw one on Unga, in the Shumagins. Gianini (1917) found magpies and nests at Stepovak Bay, and Wetmore found them nesting at King Cove and saw them at Belkofski. Dall had stated (1873) that magpies do not occur on the north side of Alaska Peninsula, but, in 1925, I found them nesting at Moffet Cove, Izembek Bay. 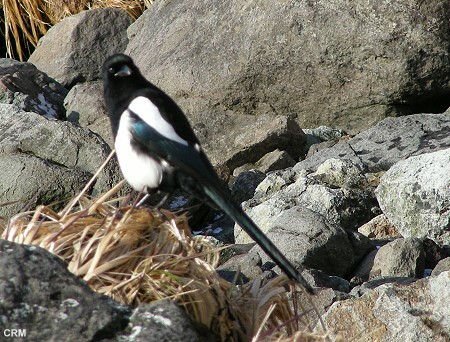 Undoubtedly, magpies are more plentiful on the Pacific side. 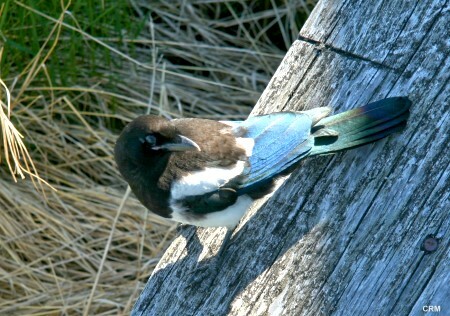 Magpies first appeared in False Pass, Unimak Island, around 1970. They are now numerous. Magpies were the culprits in raiding bank swallow nests on a high sand bank above the beach just south of Whirl Point, Unimak Island in the summer of 2009. They clawed their way into the nests and destroyed them such that all the swallows abandoned the bank. Magpies often get trapped in stored crab pots when they enter to check out the old bait smells and then cannot find their way out. Their large stick nests are located in several old sika spruce trees in the village as well as in alder brush along the valley. The bald eagle is commonly distributed throughout the length of Alaska Peninsula and adjacent island groups, and the Aleutian chain. It is numerous in some places. 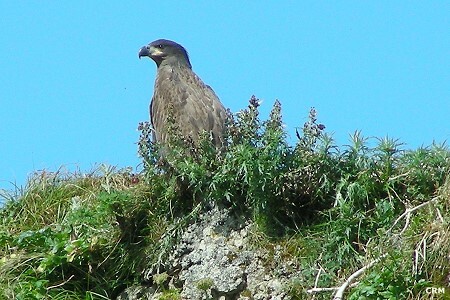 In the Aleutians, nearly every island that we visited had at least 1, often 2 or more, pairs, nesting. They are numerous about the larger islands. 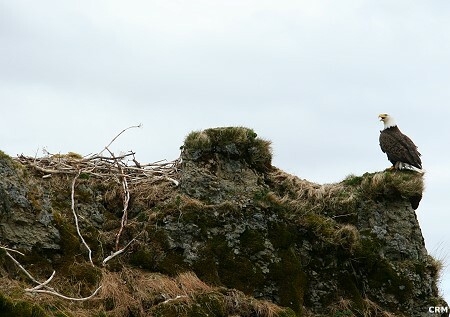 Williams noted 15 eagles in Bay of Islands, Adak Island, July 2, 1936, and more were found on other parts of the island. On June 29, we saw several at Kanaga Island. The caretaker of a fox- ranching establishment there had killed 14 of these eagles for the bounty, and he planned on raiding 20 more nests later. For some reason, the bald eagle is scarce in the Near Islands- including Attu, Agattu, and Semichi. We observed a single pair on Agattu in 1937, but we saw none at Attu or Semichi and the natives assured us they were very scarce. 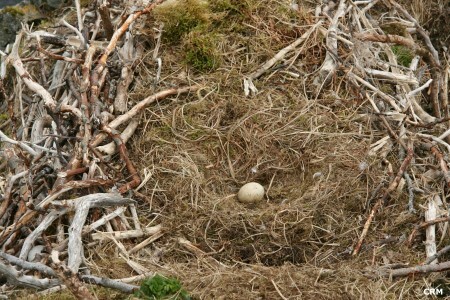 However, we found a nest on Buldir Island, and from that point eastward bald eagles were common. Not only do eagles occur along the Alaska Peninsula, they also occur on the offshore island groups. 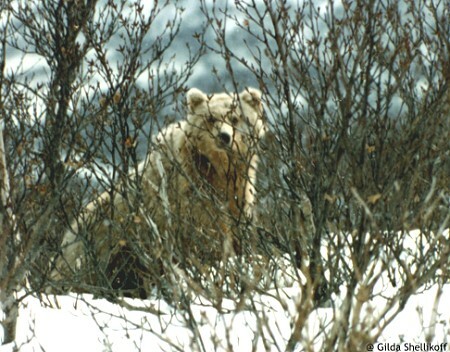 In 1940, Gabrielson observed them in several places at the base of Alaska Peninsula. At Kodiak, in 1936, one merchant erected a sign advertising the fact that eagle feet were acceptable as cash (bounty could be collected for them). "The first-year plumage is dark ; as Bent says, "uniformly dark 'bone-brown' to 'clove brown' above and below; the flight feathers are nearly black, but there is usually a slight sprinkling of grayish white in the tail." In the first year, both the bill and cere are of a blackish-slate color. The iris is brown, and the pupil is black. At this stage, the eyelids are still plumbeous." "A later phase, which possibly may represent the third year, still includes the dark bill, with a dull-yellowish hue appearing on the lower mandible and the margin of the cere. The eye is dull yellow also, and a yellowish tinge is encroaching upon the preocular area. The eyelid is gray, and the gape is yellow. There is much light speckling on the head, though the head is chiefly brownish. The specimen on which this description is based did not have the light mottling on upper parts falling into a pattern of three light patches, as was seen on many birds; instead, it was more scattered. The complete Bald Eagle text by Murie is here. "Apparently, some residents of Unimak Island had little fear of the brown bear. Arthur Neumann related that on one occasion he had forced a group of bears into the rough water of Swanson Lagoon on a stormy day to watch them struggle in the choppy waves. " "The Alaska brown bear deserves respect and should be approached carefully, because it can cause considerable damage for a few moments even after being shot through the heart. It is best to realize that although this bear is not particularly vicious, it is very curious and is likely to investigate anything unusual. The bear's eyesight is not good, which may account for its close approach at times." 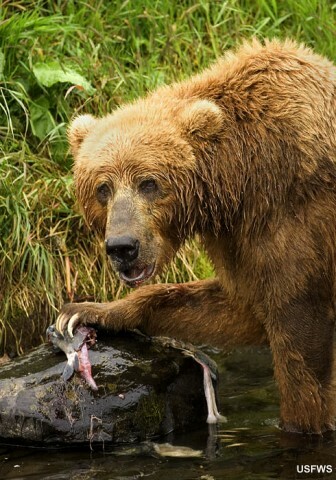 Click here to read Murie's full account of the Brown Bear. A bear video done by an amateur (author unknown) is available for viewing here. "Jochelson (1925, p. 36) found a "reindeer" antler spoon in a village midden on Umnak Island. This spoon, or the antler, may possibly have come from Unimak Island in trade." For the complete Murie account of caribou, click here. The caribou herd on Unimak Island has declined markedly in recent years such that no subsistence hunting is allowed to the local residents. The Alaska Dept. of Fish and Game has proposed methods to control the wolf population to give the caribou a chance to recover their numbers but the USFWS has not as yet allowed the work to be done on Refuge land. 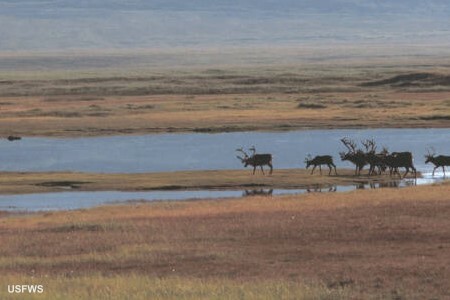 As of April, 2011, no effective solution to the declining caribou population has been agreed upon. Please see these reports for more information: USFWS Environmental Assessment, Dec. 2010 and a news report from APRN. Russian, Siberia; See-way-doos-ka (cross fox)"
"The red fox is plentiful throughout the Alaska Peninsula and is found on the eastern Aleutian Islands. 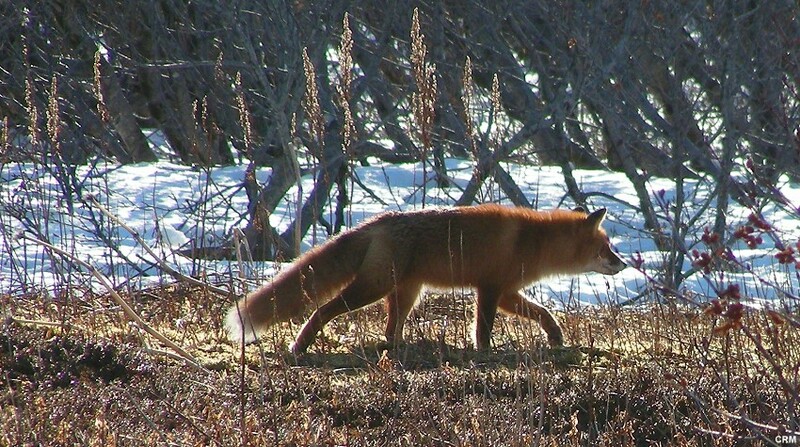 Unimak Island, in particular, has a large fox population, and the species occurs also on Akun, Unalaska, Umnak, Chuginadak, Amlia, Adak, Kanaga, and Sanak Islands. Foxes occur on Dolgoi, which was utilized for commercial fox propagation — it is possible that the fox originated here in that fashion. 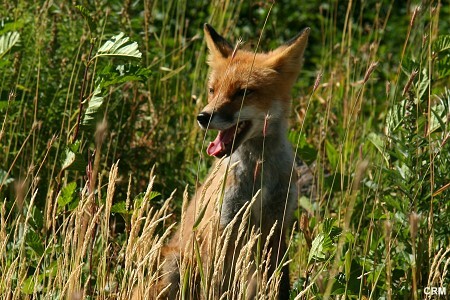 Great Sitkin, also, was said to have had some red foxes. Those on Amlia and Adak Islands are the silver-gray color phase." Foxes were trapped by the Aleuts for subsistence use in the Unimak area for thousands of years. With the arrival of the Russians after 1742, the commercial fox pelt trade began and continued after the Americans bought Alaska in 1867. Fox trapping was done extensively on Unimak until the fur market crashed around 1940. Trapping cabins were built at many remote locations on the island and on the Alaska Peninsula. Unimak Island was divided into "trapping areas" that were licensed to individual trappers. The local communities of Morzhovoi, False Pass and Ikatan depended on fox trapping for a livelihood. See more details about trapping on Unimak on this website here. 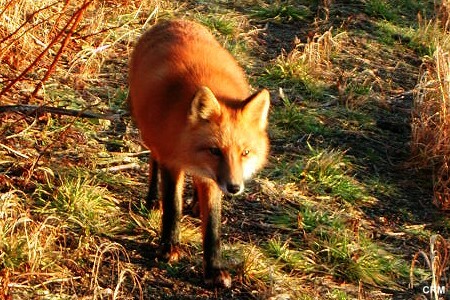 For the complete Murie article on Red Fox, click here. Hall (1951) has placed the weasels in three groups: The least weasels, rixosa; the long-tailed weasels, frermta; and the short- tailed weasels, erminea. Accordingly, the weasel of Alaska Peninsula becomes Mustela erminea arctica. 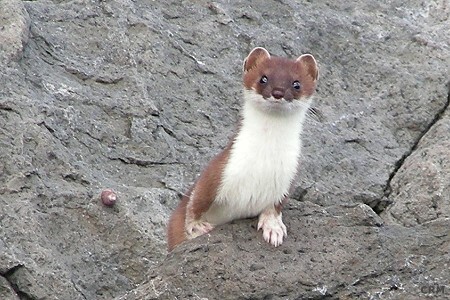 For full description of the weasels by Murie, click here. 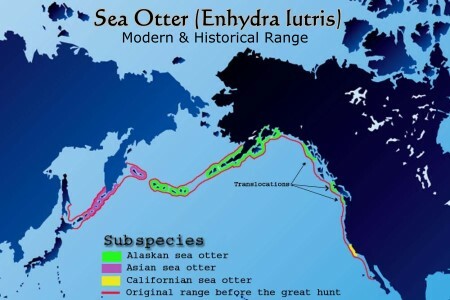 This mustelid species ranges throughout the length of Alaska Peninsula and Unimak Island, but we have no records farther west. Wetmore reported that they were partial to salt water as well as fresh, ''frequently swimming boldly out to the islands, lying off the coast." 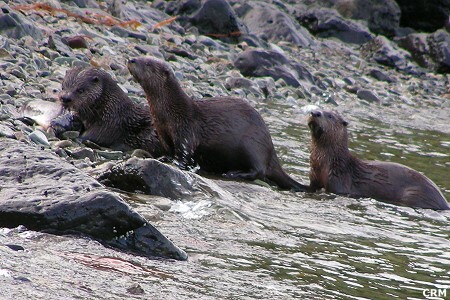 These land otters are common along Isanotski Strait and usually travel in family groups. They often make their resting areas under old abandoned buildings. Their "fun slides" can often be found on banks, with tell-tale matted-down grass and sign. They are usually very curious upon seeing people walking on the beach and if there is a dog, they may tease them by chirping and bobbing up and down. Russian: Bohr Morskoi (Steller), "sea beaver"
Medviedki, "little bears" — cubs"
"The sea otter spends most of its time in the water. When wishing to sleep, it simply lies on its back and dozes, sometimes with a strand or two of kelp across the body serving as an anchor, whether intentional or not. When feeding, the animal dives for its food, then lies on its back to eat, using its chest for a table. On specimens from Alaska that were examined, the hair on the chest was somewhat worn, no doubt through this use in feeding. When the little pup wishes to sleep, it curls up on the mother's abdomen, and both mother and offspring lie quiescent on the water. The offspring also climbs aboard the mother to nurse. When startled, the mother puts an arm around the little one and dives with it. On some occasions, the mother seemed to pat the little one on the head first, as if by this patting or pushing motion she were warning it of the impending immersion. This was never clearly seen, however, and it needs to be verified. If merely worried or suspicious, the mother seizes the pup with her arm and swims away with it." 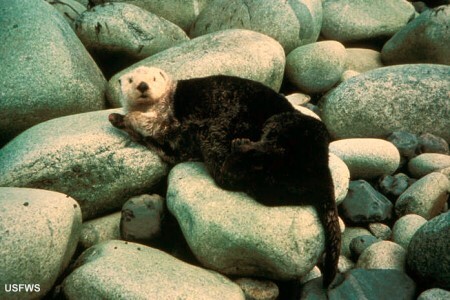 "The sea otter does come ashore, however, and there are favorite hauling-out places for certain individuals. One or more mothers may climb out on a kelp-covered rock, with their youngsters, where they squirm about and fondle their little ones and end- lessly dress their fur. Sometimes a pup will wander off to the water, or will be reluctant to climb out on the rock. Then the mother persistently forces him, nudging and pushing, until he complies with her desire to haul out on the rocks. Occasionally, a male will join the group. We also saw lone individuals, apparently adult males, curled up on a rock, where they may lie long enough for the fur to dry. Even here, they appear restless, and may raise their heads to look about, yawn, rub their faces with their paws, or otherwise dress their fur. It is reported that sea otters go ashore in times of severe storms, but that sometimes they succumb in heavy surf on the reefs. " 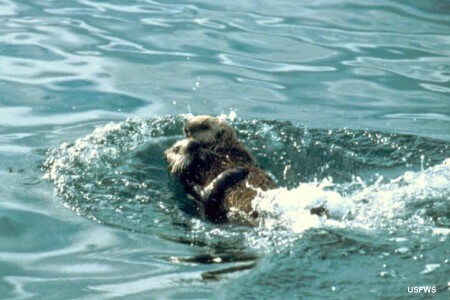 Read Murie's full account of the sea otter, here. Bob "Sea Otter" Jones (USFWS) is famous for working to save the Aleutian Cackling Goose, but he also helped reintroduce sea otters to the eastern Aleutians from Amchitka. Read an interview with Bob Jones here. 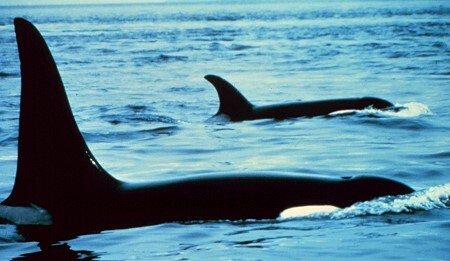 The killer whale is common along Alaska Peninsula and throughout the Aleutians. We found a dead one on Agattu Island. We generally saw them in small groups, or alone, but as many as 25 in a school were recorded. The most common number for a group was three. Ernest P. Walker (unpublished notes) has recorded some large schools of killer whales. On September 16, 1913, in Icy Straits, he saw a school of 500 or more; on July 19, 1915, near Port Armstrong he saw another school of about 300. He quotes Captain Louis L. Lowe to the effect that he had seen schools of 400 to 1,500 off the southwestern end of Kodiak Island, and, in April 1922, he saw a school of about 1,000 off Ugak Island near the Kodiak coast. "They were apparently headed northward and were no doubt keeping close company with the fur seals." "Again, Walker says — Captain Haynes says that on only one occasion has he seen a large school of killers or thrashers. This was early in June near Unimak Island, where he encountered a remarkable assemblage of various whales, seals, and other life feeding and many killers were present. There was a great deal of fighting accompanied by leaping." Click here to see full Orca account by Murie. Sea lions are found throughout all of southwestern Alaska, extending to Attu Island, where we saw some at its westernmost point, Cape Wrangell. There were colonies, numbering from 40 or 50 to several hundred individuals, at such places as Amak Island, Bogoslof (the outstanding herd),Carlisle, Yunaska, Chagulak, Amukta, Segula, Semisopochnoi, Ilak, and Buldir. Bogoslof has by far the largest and most spectacular herd — so outstanding that it deserves special consideration as an object of particular scientific, as well as popular, interest. 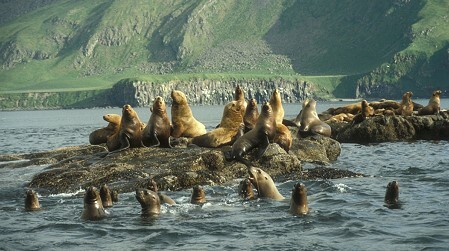 In 1938, Scheffer estimated 800 sea lions were on Bogoslof. Russian, lkhotsk, Ayan, Pengina, and Marcova: Largha (Buxton)"
"Among the Aleutian Islands, seals were usually found in the kelp beds, but they do not always seek such a habitat. I had a fine opportunity to study these animals in the spring and summer of 1925, at Unimak Island and at the west end of Alaska Peninsula. They were very common at that time. They hauled out on the boulders of the reef at Amagat Island and basked on the kelp-covered boulders near the beaches of Amak Island. In Urilia Bay, they hauled out on the sand along the entrance to Rosenberg Lagoon, and in Izembek Bay they hauled out on shoals and sandbars at low tide. A small sand island in the channel between Operl and Neumann Islands was a favorite hauling-out place. Seals pick a resting place that provides ready escape, always near deep water. If the ebbing tide recedes from a boulder on which a seal is resting, the animal will move to another rock, nearer to deeper water. When navigating the shallow Izembek Bay with our whaleboat, we could steer a deep-water course by noting the location of resting seals. Mothers and pups appear to be very affectionate, swimming near each other and occasionally touching noses. A little one would try to climb to its mother's perch on a rock. After a while, the mother might lazily roll into the water to join it; later, both might be able to clamber out on the same perch." 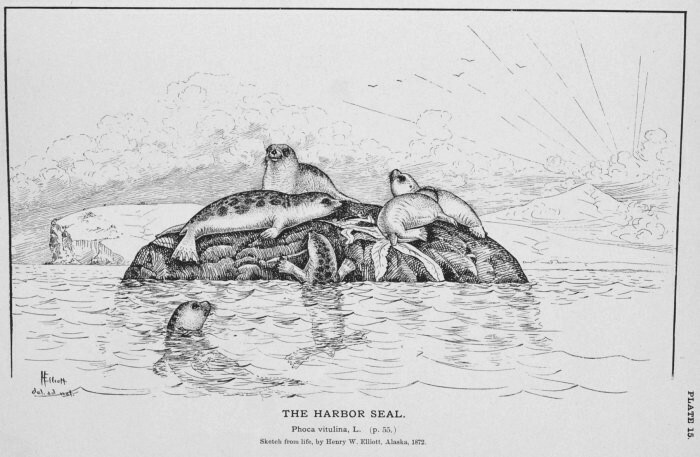 The complete text on the harbor seal by Murie can be read here. Gray Whales are hunted intensively by killer whales in the Isanotski Strait area. Gray Whales in the Unimak area often show up in early May each year on their northward migration from Baja California. They may spend several months in Isanotski Straits and the Ikatan Bay area. 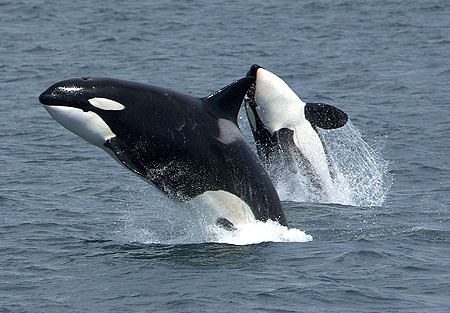 Orcas (killer whales) usually also show up at this time to prey upon the calves of the gray whale. "Killer whales bite the grey whales' pectoral fins, holding them below the surface and even rolling onto their heads in an attempt to drown them. Others bite at the tissue around the throat rather than tackle the taut outer skin. "They tear through that loose baggy throat tissue and get into the tongue," Barrett-Lennard said. "It has the effect of killing the whale very quickly through loss of blood." A February, 2011 newspaper article on the current Orca-Gray Whale situation can be accessed here. 1) Wikipedia article on Sockeye Salmon, modified. 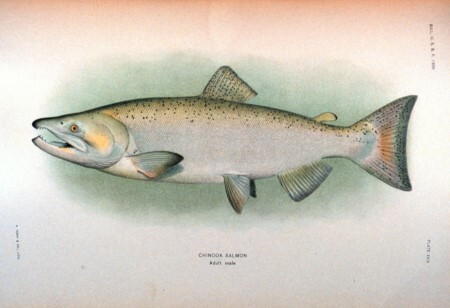 2) Wikipedia article on Coho Salmon, modified. 3) Wikipedia article on Chum Salmon, modified. 4) Wikipedia article on Pink Salmon, modified. 5) Wikipedia article on Chinook Salmon, modified. 9) Murie, Olaus J. (1959) FAUNA OF THE ALEUTIAN ISLANDS AND ALASKA PENINSULA, 1936-38, U.S. Dept. Interior, Fish & Wildlife Service, Washington. 17) Estes, J. A., Danner, E. M., Doak, D. F., Konar, B., Springer, A. M., Steinberg, P. D., Tinker, M. T. & Williams, T. M. 2004 Complex trophic interactions in kelp forest ecosystems. Bull. Mar. Sci. 74, 621–638. 18) Scheffer, Victor B., "Invertebrates & Fishes Collected in the Aleutians, 1936-38" in Murie, Olaus J. (1959), Fauna of the Aleutian Islands and Alaska Peninsula, Dept. of the Interior, U.S. Fish and Wildlife Service, Washington, D.C.
19) Estes, J.A., D.F. Doak, A.M. Springer and T.M. Williams, 2009, Declines in Southwest Alaska: a Food-web Perspective, Phil. Transactions Royal Society, Biological Sciences, 1647-1658.